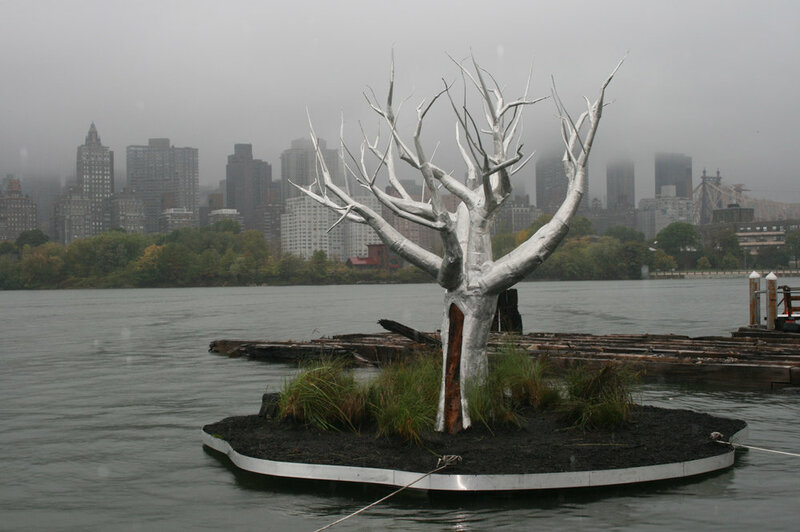 The Floating Tree investigates and celebrates the enigmatic, rapidly changing waterfront environment of Long Island City. Launched as a site-specific installation, this public sculpture was conceived as a temporary installation. It encapsulates in a single gesture the dynamism and split personality of a landscape undergoing tumultuous redevelopment. As a natural object crafted from industrial materials, the floating aluminum tree evokes Anable Basin’s historical interplay between industrial and ecological activity. Anable Basin, a 500-ft-long notch in the East River, was carved from tidal wetlands in 1868 to serve as loading slip for oil tankers and other cargo ships. Between the demolition of the former Pepsi bottling plant in 2004 and the ongoing construction of deluxe high-rise residences on the site, the developers attempted a massive detoxification operation to clear generations of pollutants from the waterfront. The site’s natural regeneration began 30 years ago, however, with the Clean Water Act and the gradual return of migratory water birds. Neighborhood groups such as the LIC Community Boathouse have quietly begun to explore the potential of Anable Basin to contribute to the life of the waterfront and the city. Floating Tree builds upon the resiliency and elusive beauty of the site. Floating upon a sculptural island planted with native estuary grasses and glowing with solar-powered lights, the Tree is designed to enhance the existing habitat for birds. The sculpture’s presence is intended to raise questions about community access and land use by inviting public spectacle at a traditionally restricted site. Although the privately-controlled Basin has long been concealed from public view, the Floating Tree identifies this tidal waterway as a cultural and ecological resource to be understood, enjoyed and preserved. Embodying the transitional quality of the present moment, the Floating Tree foreshadows and refracts the accelerating corporate promotion of the site through landscape amenities. Yet its textured metal branches and fishing-dock-inspired base express the lingering traces of an industrial past. Premiered before the New York City skyline in October 2007, the sculpture floated through NYC’s waterways, a fixture in the foreground of the cityscape. A Tree for Anable Basin was conceived, machined, and assembled by Chico MacMurtrie and the crew and interns of Amorphic Robot Works. This work was made possible by A Place in History and was supported by the Andrew Edlin Gallery.